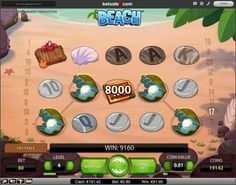 Beach, which is a Net Entertainment pokie with 5 reels and 20 paylines, offers a $40,000 top jackpot, plus features that include free spins, multipliers, scatter symbols and wild symbols. This is one of a large number of exciting slots that are part of the Net Entertainment library and will take you back to those summer days spent enjoying time at the beach, searching for sea shells and enjoying the warmth of the summer sun. A day at the beach, with all the fun stuff that comes with it, was chosen as the theme in this beautifully made slot. The beach is obviously the main theme here, and you can see it in the background. The reels are pretty much invisible, with the symbols of the game being placed directly on the sand. The game logo is at the top, right where the sea begins, and you can see the palm tree on one side, and the rocks on the other. It looks like a typical tropical beach, the kind we all dream about. The symbols start with the usual playing cards, from 10 to A, each one placed on a polished round rock. As for the rest of the images that were used, you will find the piece of driftwood with the word Wild on it, the octopus which is also a wild, the bottle with the message in it as a scatter, clamshells, starfish, conch shells, oyster shells and a treasure chest. Two different types of wild symbols are offered in Beach, with the first one being the symbol with the piece of driftwood. This one will show up on four of the five reels, the third one being the reel that doesn’t get it. The second wild, the one with the octopus, works a bit differently than the first one. This symbol will swap symbol positions that are found on the middle three reels, trying to help create a winning combination by doing that. Whenever it can help form a combination by moving symbols around, it awards a multiplier of 2x. 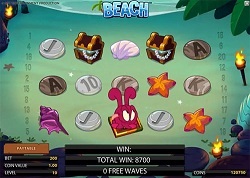 The scatter symbol, with the message in the bottle image, will give away free spins, if at least three of these symbols are on the reels, in any position. Three scatters will give away 8 spins, four scatter will give you 16 spins and five scatters will give the player 24 spins for free. A lovely game, with the kind of theme and imagery that makes us want to take a vacation, Beach is a very good choice because of its prizes and the many features included in it, with the wild swapping symbol one of the main attractions.